AWESOME…..my best July 4th party ever. I have gotten so many calls from guests raving about the quality and variety of the pizza….. others were particularly impressed with the cleanliness and presentation…..not one negative comment. You managed to feed 100 people and make it look effortless…. the evening was an absolute hit and I thank you. Just wanted to drop you a note thanking you oh so much for making our party a grand success. I can’t believe that you were able to please four generations so easily. The kids were absolutely thrilled with all the attention you gave them and the old guys, 5 ninety year olds, had a ball. I made many trips back and forth with pizza for them and so did your little helper Quint! I never got so many phone calls afterwards from all my relatives about how good a time they had. We have a party like that here with a different family picking the theme every year and you got voted best ever. We held a party for children and adults and I have never seen some much pizza eaten and sincerely savored—even by many carb conscious adults. This pizza is like nothing else in terms of taste and quality—its fresh, made to order and only the finest ingredients. Its also a unique twist to any party as the very tasteful brick oven stove can be right there in the open for all to marvel at. Pete is also very accommodating and will make whatever you or your guests like. He even made a dessert pizza. I highly recommend Carmelo’s Brick Oven Pizza. The raves keep coming from our guests – the pizza’s were amazing, the ingredients were super fresh and the toppings really creative. From my perspective as a hostess, Peter was very professional and the whole event went incredibly smoothly from planning the menu to set-up, the actual dinner and clean-up. Peter made my husband’s 50th birthday party a memorable event and it was a huge hit with our family and friends. I wholeheartedly recommend him. We wanted to formally thank you for the wonderful job you did for our sons 1st birthday party last October. All of our guests were very impressed with your food, your oven and your presence. All of the pizzas from the plain for the kids to the unique and fancy for the adults were delicious. The dessert pizzas were a huge hit as well. Just as important though, we are very thankful for your professional attitude and presentation (right down to your chef’s jacket). Your showmanship and ability to work the crowd helped keep things in order and were certainly a focus of the party. Lastly thank you for coming all the way out to Long Island from New Jersey on the day before hurricane Sandy arrived. Your call early that morning saying that you would not be deterred certainly put our minds at ease. We would be happy to be a reference for you in the future and we look forward to the next opportunity we have to hire you. We wish you all the success you deserve. We had Carmelo’s Pizza truck at our family party and it was a huge hit! Unlike a traditional caterer who simply provides food, Chef Peter brought an ‘experience’. He came early to set up his mobile brick oven towed behind a pickup truck. That’s when the magic began! He and his assistant crafted homemade mozzarella. He served this as an appetizer atop tasty heirloom tomatoes. In addition, we had roasted vegetables and sliced skirt steak tidbits to munch on before the pizzas. Guests could stand around the mobile kitchen he set up and watch his magic as they munch on his amazing pizzas. Chef Peter was quite entertaining. Not only that, but he brought plates, napkins and pizza condiments. We simply served a salad on the side, but that wasn’t even necessary as he made a fantastic ‘salad pizza’. It was fun sampling his different creations plus he would take requests so we could come up with our own concoctions. The crust was to die for and he had a large sampling of different fresh ingredients. The presentation of the pizzas was special as he used squeeze bottles to drizzle olive oil, etc. atop his wood-fired pies. Even though I couldn’t eat another bite, I managed to find room for the awesome dessert pizzas. He had a sweet crust topped with items such as fruit, chocolate, Nutella and cookie butter. Quite good. Best of all, his price was reasonable and he took all of the effort out of a large party. Don’t hesitate to hire Chef Peter! Best pizza in the universe! Thanks Pete. Wow the pizza is perfectly cooked and they are so creative, anything you can imagine on a pizza they will do for you! Everyone loved this at my husband’s 40th! The pizza was so fresh, everything was top notch. Lobster ceviche and pulled pork were my faves! So delicious, thanks Peter! My husband and I just attended a wedding reception in Rotterdam, NY, catered by Carmelo’s. The pizza was exquisite. I told my husband we needed to renew our vows just so we could have a reception and hire these guys. We recently had Peter and his crew cater a party for 100 people and they did a fabulous job. From the appetizers to salads and the pizza, all of our guests raved about the food. Peter was fantastic, had a big party at my house for the Don Bosco Crew team! Everyone raved about the pizza. It was nice not having to worry about feeding everyone. Peter took care of it all! I highly recommend Peter for your event! Awesome job! Amazing food and owner!Peter catered our wedding in NY back in 2013. I still haven’t forgotten about him! – Rachel ArnoldThe best choice we’ve ever made! We recently had an engagement party at my parents house with Carmelo’s as our caterer. Not only were these guys an absolute pleasure to work with, but the pizzas were amazing! The ingredients were fresh and the options were endless. Our guests all texted us the next day raving about the food. Do yourself a favor and book your next event/party with Peter, he won’t let you down! Peter and his right hand man, Lorenzo, were the hit of our son’s birthday party. The pizza was a crowd favorite among the kids and the adults and he couldn’t make them fast enough. As soon as he took one out of the oven, it was gone! This dynamic duo were excellent with the crowd, making the experience interactive and even more fun. All our guests were blown away with the experience. Thank you! Great job! Delicious pizza, outrageous salad, super service, fantastic pizza oven and everyone had a blast! I just wanted to let you know what a blast everyone had at my daughter’s communion party, and much of that had to do with you. Everybody still talks about the pizza’s, and what a nice guy the pizza maker was. Your professionalism, friendliness, and great tasting food blew away my expectations and made our daughters party one to remember! Thank you so much for the great job you did last night at Rachel’s graduation party. EVERYONE raved about how great the pizza was and the italian ice was the perfect ending to a great night of food and fun! Rachel asked if we could do it again at the end of the summer! Everything you said about the great food, good time and entertainment came to pass and we couldn’t be more appreciative of your time and service! Natalie’s favorite was the pumpkin butter drizzle – that’s a new one! We look forward to working with you again, in the future! For as long as I can remember I have been throwing annual football tailgate parties as a thank you to all my customers. In the past I have always opted to do all the cooking myself. I have always been hesitant to use a catering service for these parties. However, for the first time ever I decided to hire someone to take care of the food. The experience provided by Carmelo’s Brick Oven Pizza was so spot on I will never go through the hassle of preparing the food myself again. 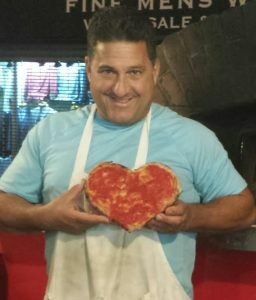 I ran into Peter, the owner and chef of Carmelo’s Brick Oven Pizza back in October. He was doing an event at Packanack Lake in Wayne and it was not his food but his presentation and charisma that caught my attention. About a week later he and I began discussing putting together a menu for my party. Peter was extremely helpful throughout the whole process. He was willing to accommodate any request. On the day of the party he showed up on time ready to go. Once guests starting arriving he began serving food. He had pulled pork, breakfast burritos, and a variety of pizza to satisfy any request. The food was spectacular and all of the guests raved about it. If you are looking for someone to come and cater to a large group of guests Carmelo’s Brick Oven Pizza is the way to go. The food, presentation, the oven, and Peter himself make for a wonderful culinary experience. I would recommend him to anyone for any occasion. This tailgate party was a huge success and I have Peter from Carmelo’s Brick Oven Pizza to thank for it.